Like many of you out there, I spend most of my January trying to put my post holiday self back in order, which is never as easy as it sounds. Coming off a steady stream of holiday parties, over indulgences and one too many nights of more cocktails than necessary - I always turn to January as a time to realign my priorities and bring the focus back to health. Personally, that means going dry in January and sticking to it. What I love about this approach is that it brings mental clarity and allows you to focus on your goals for the upcoming year. I have always found that about two weeks in, you start getting the best sleep of your life, hands down. Gone are the days of waking up clouded and bloated. This year, we decided to layer in Whole30, which I will preface with, this recipe is NOT Whole30 compliant, but Whole30 did lead me to where I am going. While not the easiest of meal plans to stick to, what I have loved about Whole30 is that there is strong community support among those who have committed to taking on the 30 day program and it has challenged me to think outside of my normal cooking routine. Plus, for most people, removing the alcohol is the hardest part, and we’d quit that nearly two weeks before we started the Whole30, so half the battle was already won. Inspired by the community that surrounds me, and in particular by Stacie and Jess over at The Real Food RDS, I found myself cooking one of the very recipes from our Vitamix program: Spaghetti Squash Alfredo with Chicken. I had never before tried, or made Cashew Cream, which is surprising, given how often I was seeing recipes for it. What intrigued me about the recipe is that it uses raw cashews, nutritional yeast and a few other basic, on-hand items, to create a ‘cheese’ like sauce that is healthy and vegan. It was delicious, and I was hooked. When Vitamix asked us to work with them to introduce their new Venturist machine through a program focused on meal prep, I immediately raised my hand. Not only am I a daily Vitamix user, but I was craving the need to be back in the kitchen, creating, tinkering and learning. 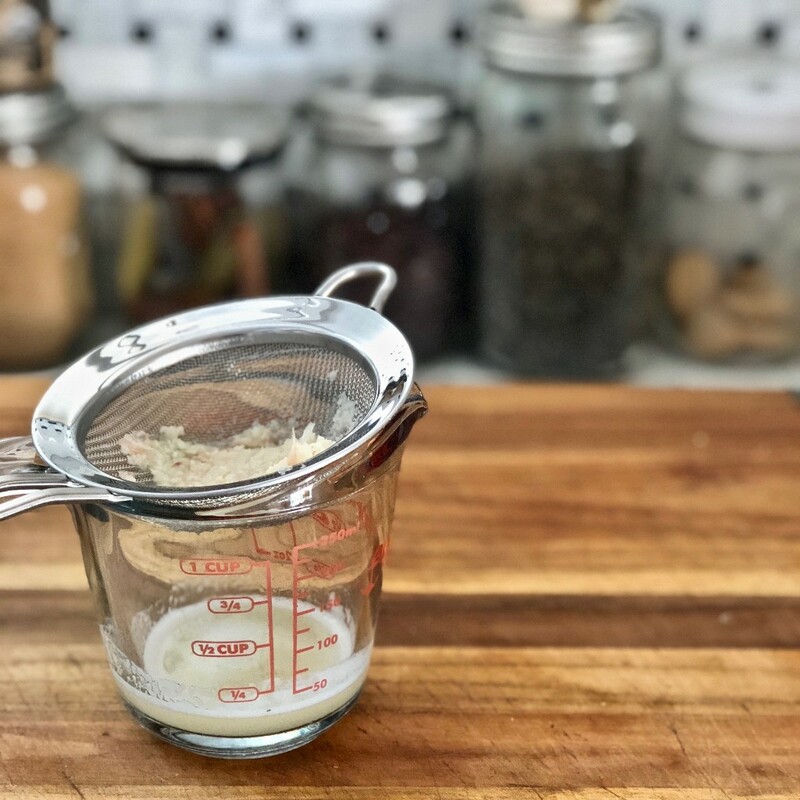 Diving head first into the meal prep angle, I wanted to create a recipe for Macaroni and Cheese that used the Vitamix to prep the Bechamel, without a stove, and prepare the sauce ahead of time, which would allow for an easy assemble weeknight meal. While they say ‘third time's a charm,’ I kept hitting brick walls, my recipe was not working out. My epiphany came in the form of The Real Food RDS’s recipe for Cashew Cream - maybe, I thought, I could use a modified version of the Cashew Cream base and add cheese - which, while not Whole30, would provide a much lighter cheese sauce base for a midweek macaroni and cheese. My hunch was a total success. The sauce that this recipe yields is silky, delicious and rich - all with only 6oz of sharp cheddar cheese. Because the Vitamix Venturist comes with THREE container sizes, I borrowed a technique from Chef Michael Solomonov. Using the baby size container (8oz), I processed the heads of unpeeled garlic with the lemon juice to a fine puree and set aside while I made the rest of the sauce. This allows the lemon to soften the garlic bite. 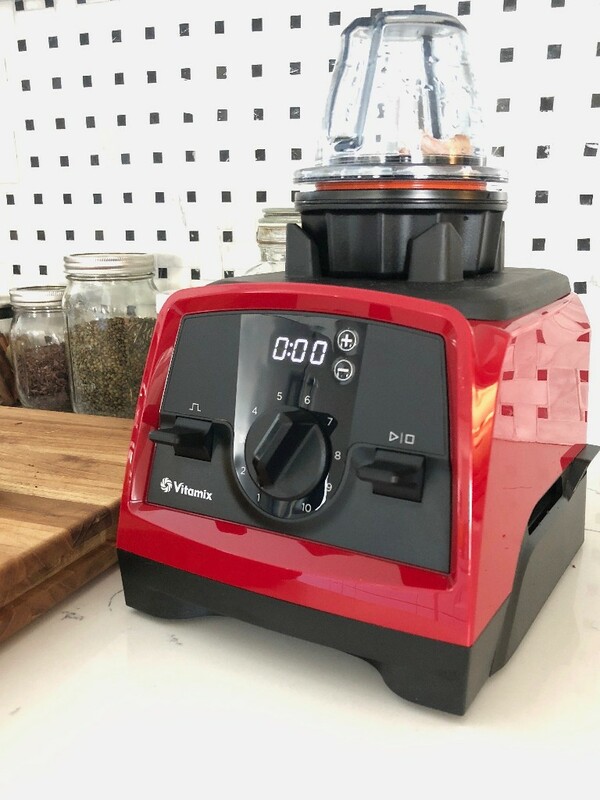 The new Venturist Machine has the same power we’ve come to love and expect from Vitamix and pulling this recipe together is quick and most parts can be made ahead and assembled day of for a quick midweek, satisfying dinner. 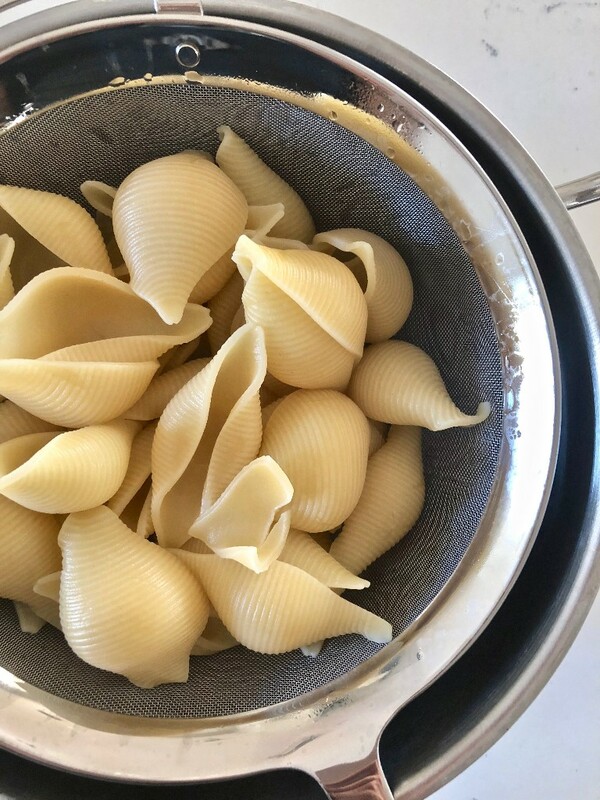 Sunday Game Plan: Cook the dry pasta shells just shy of al dente (cut about 2 minutes from the package directions), drain, rinse, cool & and toss into a large resealable bag. 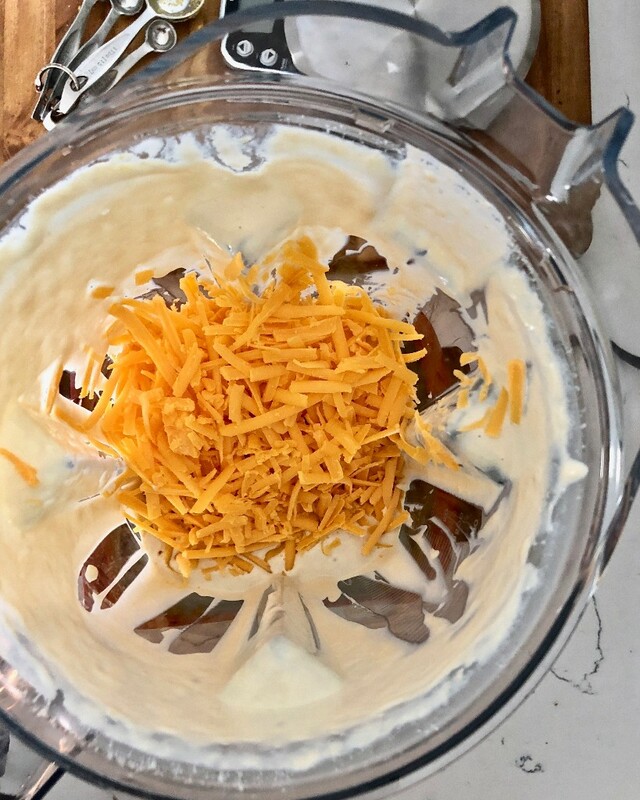 Make the cheese sauce in the vitamix and pour into a glass jar or container. 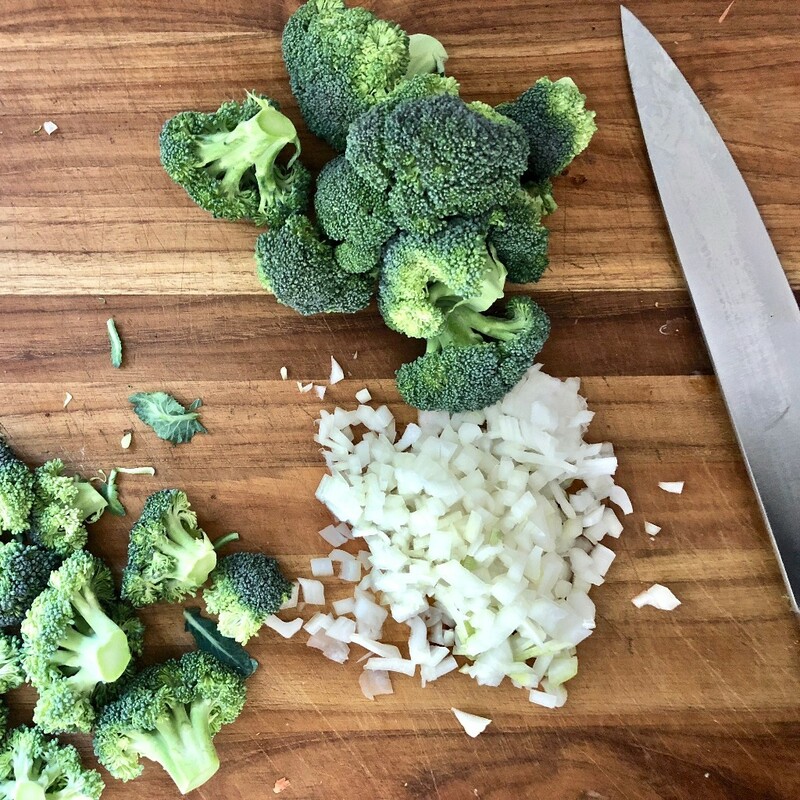 Prep the Broccoli and place in a resealable bag. All of these will last in the fridge up to 3 days! 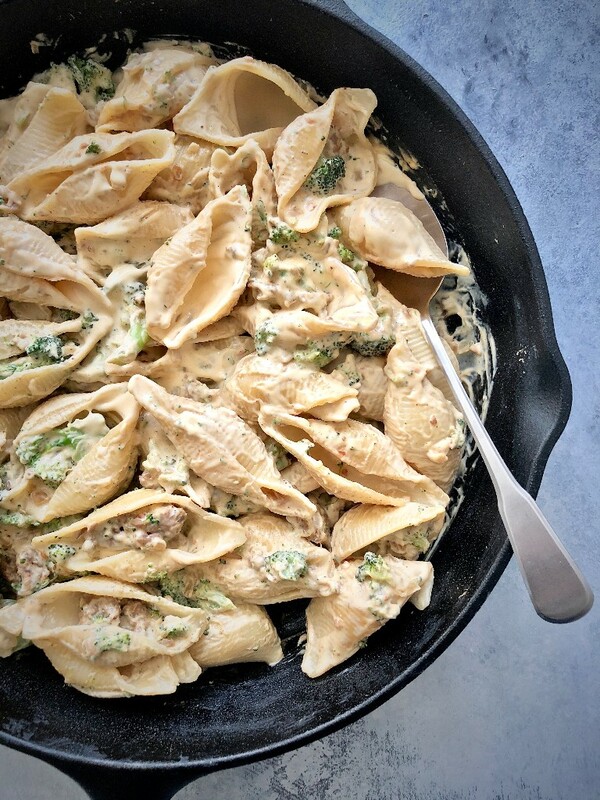 Day Of: Cook the sausage, onion and broccoli in a large cast iron skillet, add the pasta and the cheese sauce and heat through - serve straight from the pan! In a large bowl, combine raw cashews and 2 cups boiling water - cover with plastic wrap and set aside. Bring a large pot of water to a boil and add 2 tablespoons salt - cook pasta and reduce cooking time by 2 minutes from the directions listed on the box. In a large skillet, cook the sausage over medium heat, using a wooden spoon to break into small crumbles, about 6 minutes. Add onion and broccoli and stir to combine. Continue to cook, stirring occasionally until the broccoli is just starting to turn tender, about 6-8 minutes. While the broccoli cooks, prepare the cheese sauce. Dump the contents from the 8 oz. container into a fine mesh sieve and press the garlic/lemon juice into a small bowl & discard the solids. Drain the cashews. To the 64 oz. blender jar, add the cashews, garlic/lemon juice, almond milk, nutritional yeast and salt. Blend on high for 2 minutes. 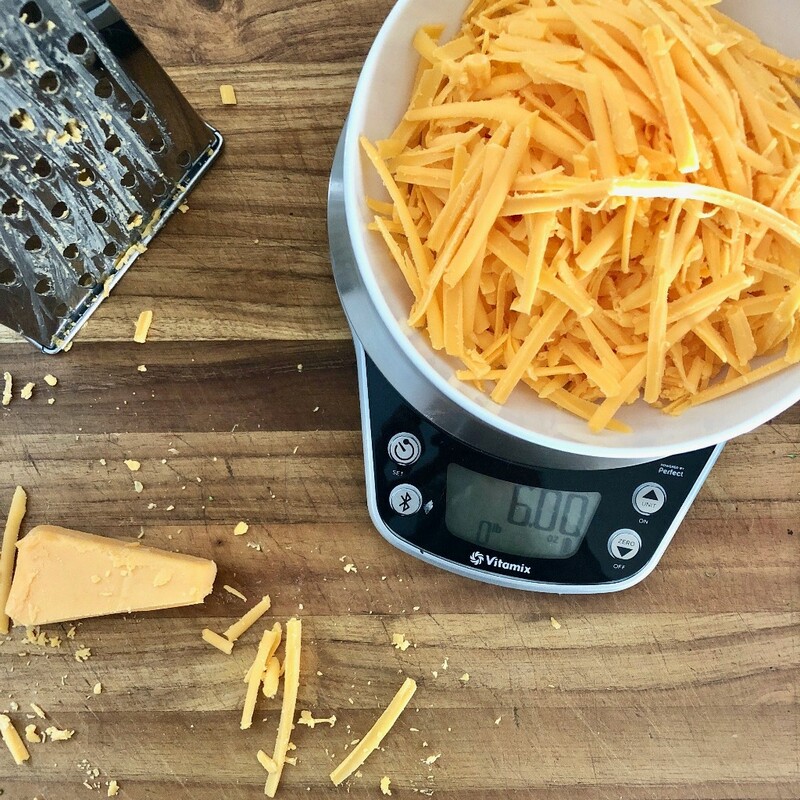 Scrape down container with the blade scraper and add the shredded cheese - blend on high for an additional 2 minutes, or until all the cheese is incorporated. 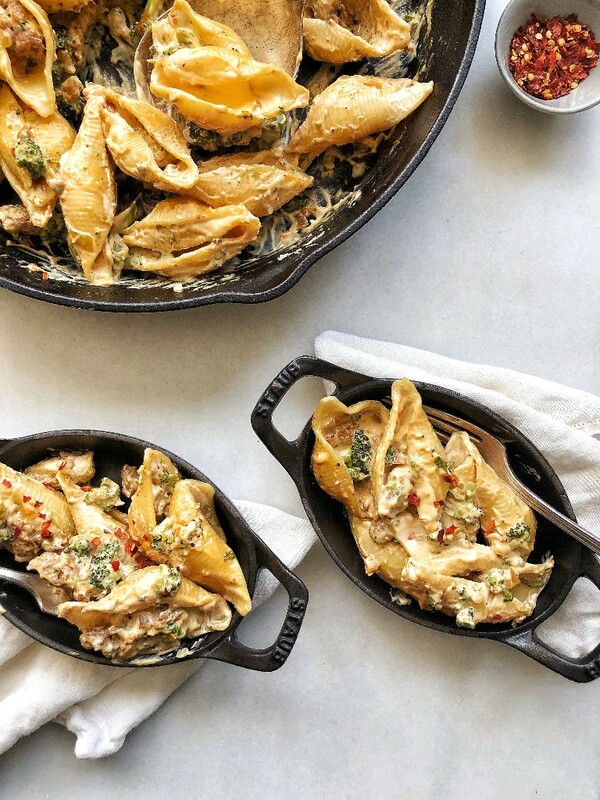 To the skillet with the sausage, add the drained pasta and cheese sauce and stir to combine over low heat and gently warm until the shells are warmed through. Serve immediately. Leftovers can be kept for 2-3 days in an airtight container.